zseLEI Service is an internet application and service for requesting and assignment of Legal Entity Identifiers (hereinafter LEI) under the management of The Zagreb Stock Exchange. In accordance, zseLEI Service also fulfills the role of transparent and simplistic overview of assigned LEIs and related legal entity's data. Main interface of the zseLEI Service website consists of navigation menu, welcome text, registration link and links to the PDF documents containing this help documentation and General Terms and Conditions of the zseLEI Service in the right sidebar. Language changing buttons for Croatian and English are positioned in the top right corner of the page. Browsing of the assigned LEI does not require user registration and is available from the main navigation bar by selecting List of assigned LEI option. In this view it is possible to browse through the assigned LEI. Table view can be filtered by Legal Entity Identifier (LEI), Entity Name, Entity country (country in which the legal entity is registered) and by the Business Registry Number of the business registry in which the legal entity was registered. 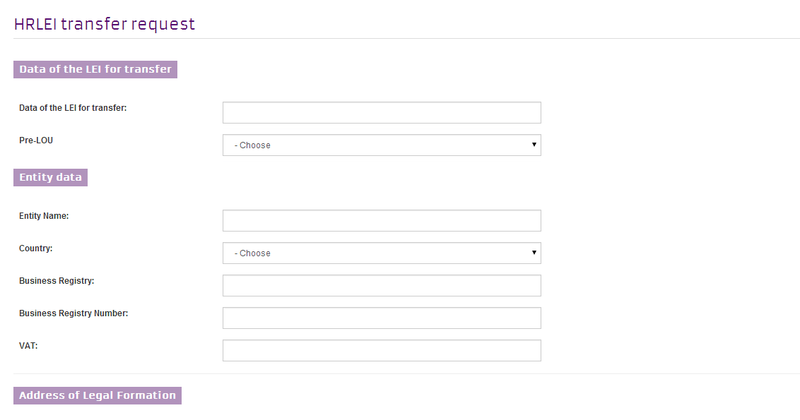 Search form can be reseted via Reset button and new search can be started with different input data. After finding specified Entity or LEI, additional details for that legal entity can be retrieved by clicking on the icon. Selected action puts the user on the screen with the summary of the specified Entity data. Given data can be easily exported to XLS or CSV file format via Export button (after checking the box in the Export column near one or more entries) for offline processing and detailed LEI information. Selected view contains XML datafiles, sorted by date. 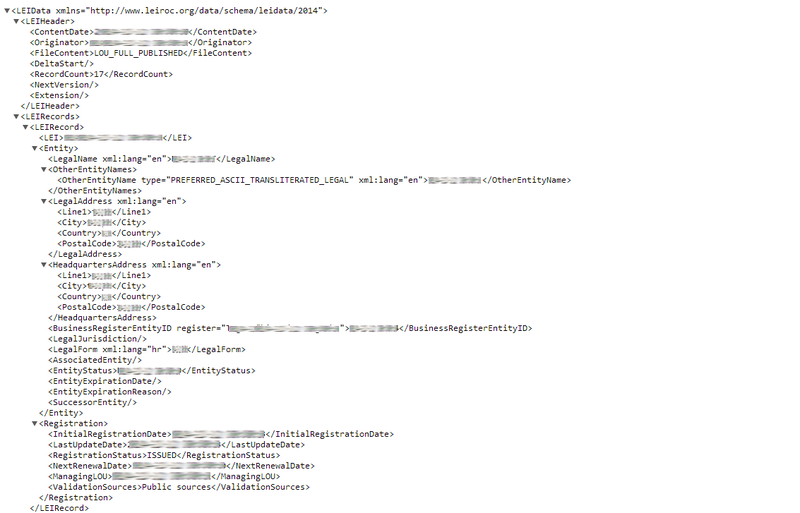 Contained XML exports consist of full XML data file (contains all released LEI datasets till date) and delta XML data file (contains only added or changed LEI datasets for the day before). By default, data for the current month is displayed. Data can be viewed or filtered by month. Additionally, all of the exports can be shown by clicking the Display all data button. XML schema conforms to the standards defined by W3C and LEI ROC. Datafiles are given in the ZSE_yyyyMMdd_TYPE.xml notation and are generated at consistent times. User can examine XML data in the browser by clicking the desired datafile or download it to his computer. All displayed data is free to download as designated in the General Terms and Conditions of the zseLEI Service. Registration process is initiated from the homepage of the zseLEI Service website by clicking on the Register button. By clicking the registration link, user will be taken to the registration form where all the data except State / Region is mandatory for fulfillment. E-mail Address of contact person (employee of the legal entity or an agent) is also used as the username that will be used for user login and contact. It is highly recommended that the e-mail address used for registration is within official e-mail domain of the company (except when the user acts in the form of an agent for another company). Password is user-defined and must not be shorter than 8 alphanumeric characters. Contact Person data relates to the person who will manage LEI requests and act as a contact person for the legal entity in question (in case of an agent, that data relates to the agent, as well as Legal Entity Data relates to agent's place of employment). This data will be used for pre-invoice and invoice generation and can be changed later if needed. After filling in all the required fields, user must accept legal notice and input simple captcha (basic spam and bot prevention) to proceed after clicking on the Save button. 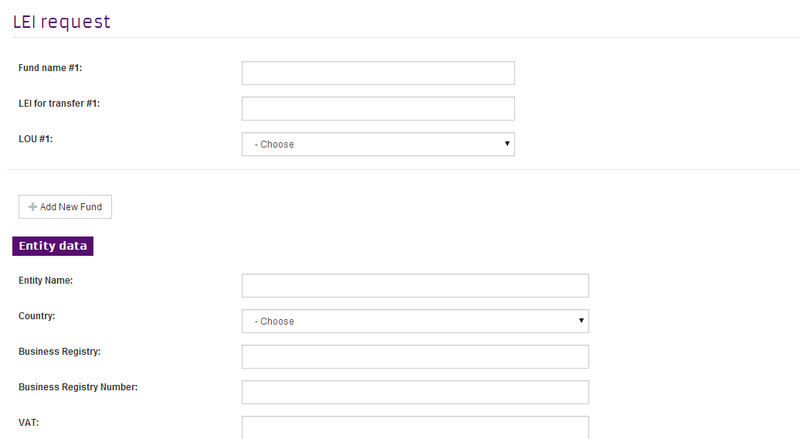 If required fields are not filled in, user will not be able to finish the registration process. Please, take notice that the captcha text is case sensitive. After successful form submittal, activation link will be dispatched to the user's e-mail address. Activation link has an expiry period of 5 days. Failing to activate user account in given period with provided activation link, user will have to repeat the registration process. After successful activation, user can login to his user account immediately by clicking the Login button in the right side of navigation menu. On the login screen, it is possible to initiate user password recovery procedure in case of forgotten or misplaced user password by following the Lost password link. Password recovery is done using the e-mail address that the user provided during registration process. In case of deactivated e-mail address or any other problems with logging in, please contact the zseLEI Service administrator. Main user interface consists of main navigation and user-specific navigation (visible after login, in the same navigation menu). 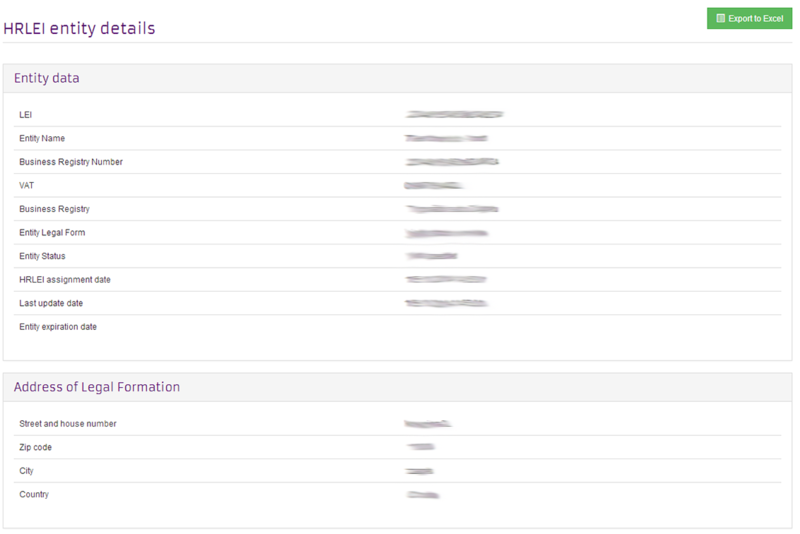 User now has the option to submit the request for LEI, preview the list of all his sent requests and their statuses, change his user data (billing address and other data). There are also logout link and link to the online help documentation. Request for the Legal Entity Identifier or LEI assignment is done by choosing New request menu option and LEI request submenu option as shown below. Legal entity employee can submit only one LEI request and does so exclusively for his company - as such, he needs no special documents other than offical e-mail address and contact data - except if requested for additional evidence from the zseLEI Service administrator. In the next step, application will load identifier assignment form. All the data in the form is obligatory (except State / Region field) to fulfill. In case of an agent user type, user must also upload power of attorney as a proof of authorization (see below). User that acts in the form of an agent must also upload power of attorney by Select file button. Chosen button will open operating system's file explorer application and allow user to choose and attach the document to the zseLEI request in question. At the end of the application form, there is also Billing information check button. Users should make sure that the billing data is correct before proceeding with request submission otherwise they should restart the LEI request process (after correcting the billing information) or contact the zseLEI Service administrator. If the displayed data is not correct or the billing address has changed, user will need to update the data in new window by clicking the Change billing data button. After clicking the Change billing data button, user can quickly change his billing information. Clicking the Save button will save the data and return to the LEI request form. Upon checking payment address and other data, user can submit his new LEI request for approval. 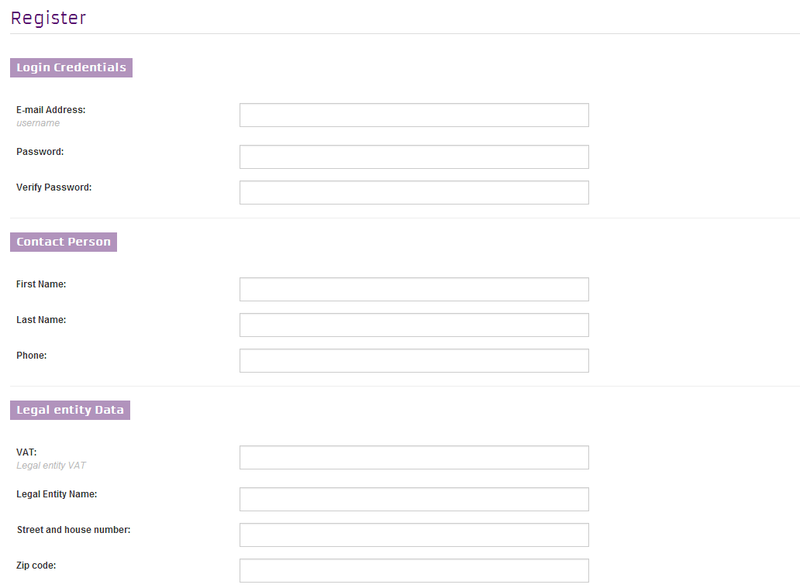 In case of missing or invalid data, application form will notify user upon needed changes and missing/invalid fields. After all of the form data is checked as valid, user can submit his request which then goes to the administrator for review and approval. Submitted request will show up in user's List of requests menu. Every major part of the request process is followed up by the appropriate e-mail message notifying the user about request progress and status. After the zseLEI Service administrator reviews user's request, user will be notified by e-mail in case there are changes he must apply to original request. In case there is no need for the additional input from the user, billing procedure will commence and user will be contacted with payment information. After the payment has been resolved, LEI will be assigned and user will be notified via e-mail. User can follow various steps of assignment process in the zseLEI Service interface. Request for Fund type entities is done by choosing the New request menu option and LEI request (funds) submenu option. Upon choosing funds submenu, user is taken to the similar form as for basic LEI request with the difference of first being asked to input the Business Registry Number of the fund management company (that is responsible for the management of fund or funds). In the second part of the form, user must input similar data as for the basic LEI assignment request, as well as fund names. If the user is requesting LEI for more than one funds, he can request them immediately or at any other point after with Add new fund button (new Fund name field will appear). LEI for the fund management company is requested as a separate request if needed. 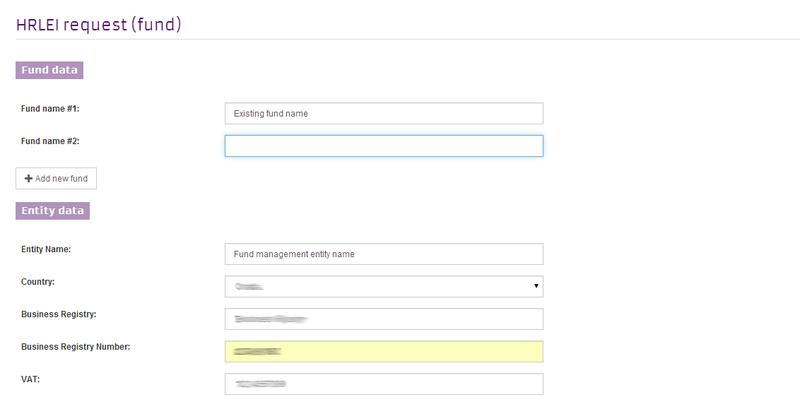 If the user just wants to input a new fund (fund name under the same fund management company for which he has already opened one or more requests), he can easily do that through LEI request (funds) submenu and by inputting the existing Business Registry Number - and if there are already requests associated with the Business Registry Number, they will be displayed in the next step. In case the user (e.g. user is an Agent) wants to input new funds under some other fund management company, he needs to input new Business Registry Number and fill in the legal entity data as described above. Again, after all the form data is valid, user can submit his request which then goes to administrator for review and approval. Submitted request will show up in users List of requests menu. Transfer of Legal Entity Identifier from another pre-LOU is done through the New request menu and LEI transfer submenu option. 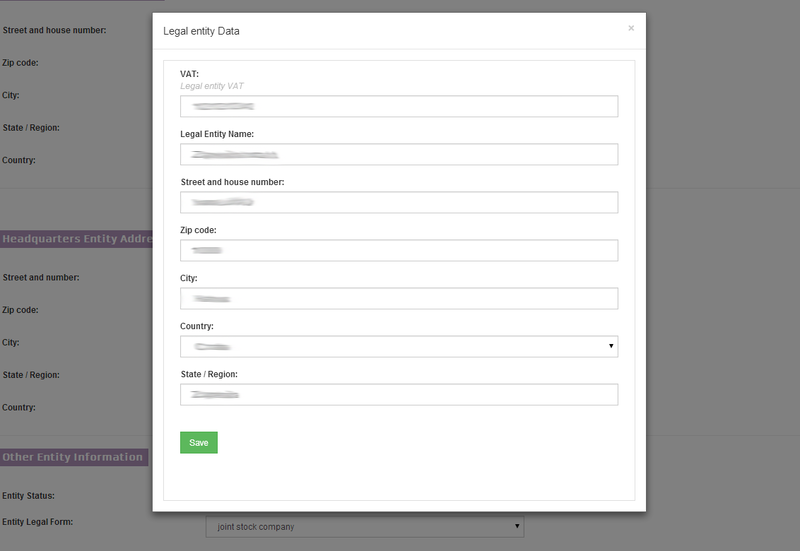 In this form, user is asked to enter legal entity data and additionally to fill in (or choose from dropdown list one of the offered choices) legal entity's assigned LEI and LOU (Local Operating Unit) where LEI was assigned. If there is a LOU that is not offered in the dropdown list, user can append it manually through Other option. After the user submits LEI transfer request, zseLEI Service administrator will check and contact the user regarding pending procedures for completion of the transfer similar as to all other LEI requests. 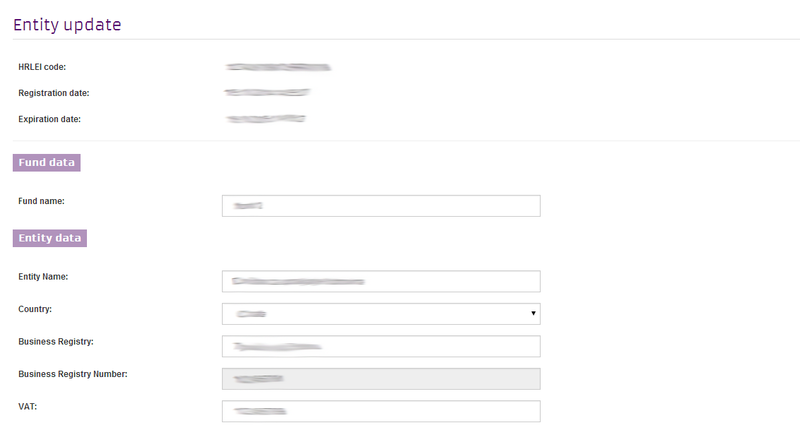 In the request for LEI transfer it is obligatory to upload filled in and scanned Authorization form in the displayed field. In this form, user is asked to enter legal entity data and additionally to fill in (or choose from dropdown list one of the offered choices) legal entity's assigned LEI and LOU (Local Operating Unit) where LEI was assigned as well as fund names for belonging LEI codes. Option for the LEI renewal request will become available in the user interface 45 days prior to the expiration date of LEI in question. By entering the grace period, user will be notified by e-mail (which he has given during the registration) to log in into the zseLEI Service and request LEI renewal. 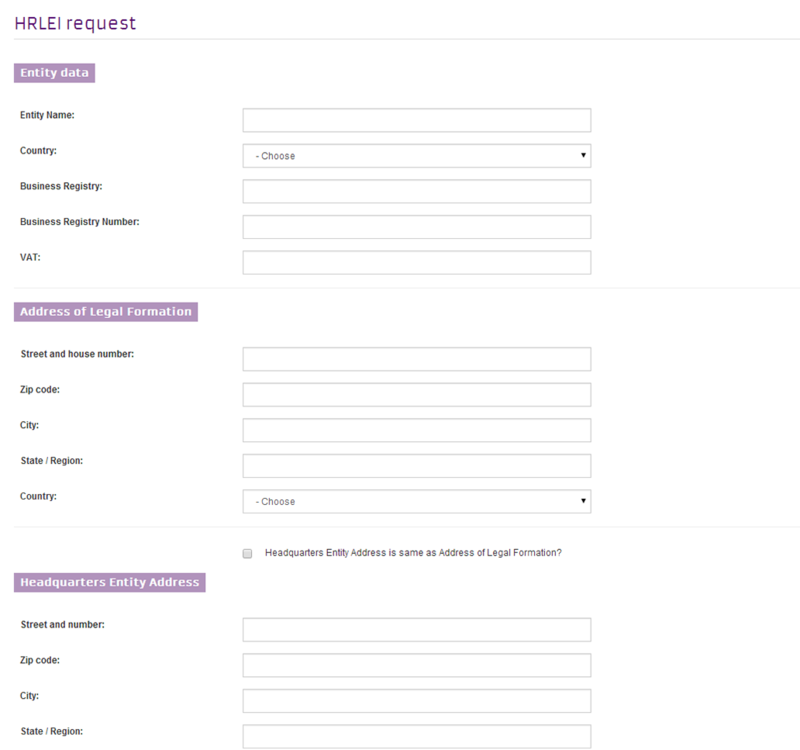 User should log in into the zseLEI Service, choose Renewal request option form the List of request menu and validate if the entity data for the given LEI is correct. Also, please note that users should check that the payment and contact data is valid. In case some entity data needs to be updated, user can do so through Entity data option under the List of request menu. After the changes have been approved by zseLEI Service administrator, user can proceed with LEI renewal request. After the completion of renewal request process, LEI code will be renewed for the period of one year. In case user does not recieve first reminder, he will be notified by periodic e-mail messages of due expiry date for the LEI code. In case user does not wish to renew his LEI code, it will change status to lapsed after the due date. After successful submittal of LEI request (or requests), user can see the status of his requests in the List of requests menu. 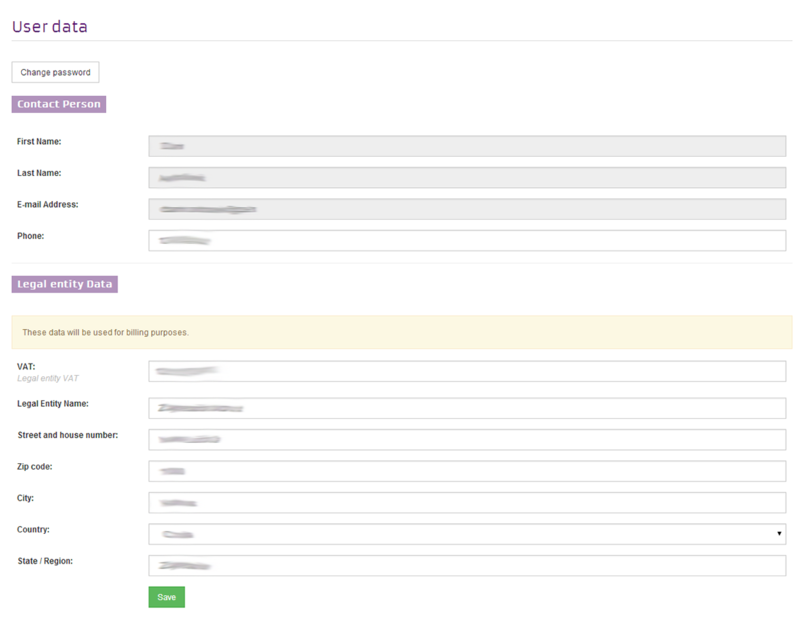 In this view, user will see requests that are in need of his attention or general details about requests and options for various actions upon them. For every change on the submitted LEI request, application will notify user by e-mail. Updates and maintenance of the pre-Legal Entity Identifiers is done through this menu. Activity history related to the specific request is also viewable in this menu via icon. Under the Action column, user can update entity data related to assigned LEI. Submitted updates must be validated by zseLEI Service administrator. User is notified by e-mail if the updates have been approved or rejected. Under Report Corporate action link, user can report specific corporate action being conducted over an entity and must upload additional documents pertaining the corporate action in question. Depending on the corporate action that is being conducted over the entity (actions can be chosen from the dropdown list), user should be able to provide the exisiting LEI of surviving entity. From the List of requests menu, there is also Report Entity dissolution option, where user needs to upload legal documents regarding the entity expiration reason. The date of the entity expiration is also expected to be provided by the user. 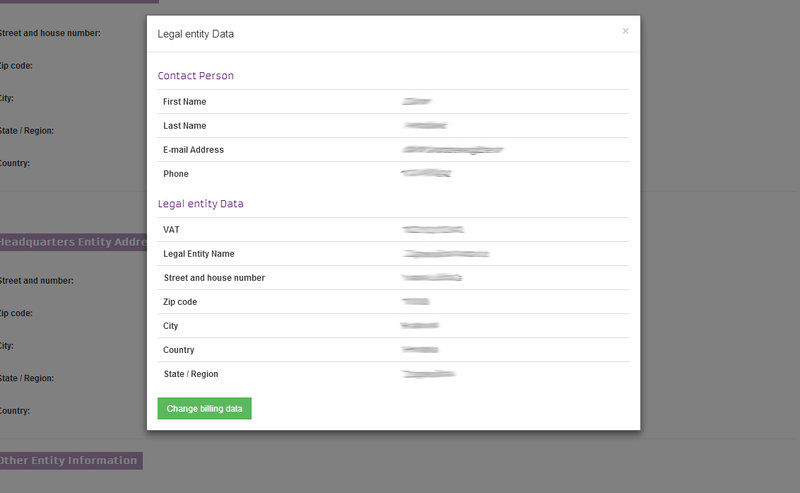 In the User data menu, user is able to change his billing address, contact phone number and change his password if needed. E-mail address change is not possible by the user, but only through the separate request by e-mail to the zseLEI Service administrator and under justified reasons (misspelled e-mail, corporate e-mail change, etc.). Legal Entity Data is also used as the billing address as all the billing from the LEI requests are sent to the legal entity of the employee. After user has finished his tasks in zseLEI Service it is strongly advised to logout from the application by clicking on the Logout button. As a security measure, user will still be automatically logged out after given period of inactivity (in case the user has unsent requests or changes, he will have to login again to continue his work and start over, as the application doesn't save form data automatically). Help menu contains this document. If You need additional instructions, please contact the zseLEI Service administrator. Images of captured screens in this documents are used only for demonstration purposes and as such - text data irrelevant to the application navigation, usage and legal entity-specific data have therefore been blurred. In case of additional questions or if You have possible suggestions, please contact us by e-mail at lei@zse.hr. Also, if You need help with managing or requesting Your LEI data, feel free to contact the zseLEI Service administrator by telephone numbers or e-mails listed under the Contacts section.